ON the surface, “Trouble With the Curve” may look like a baseball movie. After all, it is about a scout and many scenes are shot in ballparks across the United States. 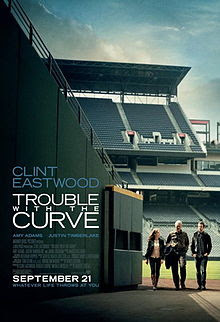 “Trouble With the Curve” is actually a buddy film, though an atypical one. In this variation on that theme the pals are father and daughter, Gus and Mickey Lobel, played by the unlikely duo of Clint Eastwood and Amy Adams. The film opens nationwide today. Opening today in wider release is “The Master” (http://www.bit.ly/R0yhx7)… More shortly.